I felt like a little kid who was just told they’d be going to Disney World. London. And since then I’ve been training, lifting, analyzing, fixing...patiently waiting like a junkie for my next fix. Here it was. See, the week after my 2017 track season ended in September, I put a world I’ve known for the past 14 years on hold, to pursue a new sport: bobsleigh. I headed to Calgary with a dream in one hand and my work ethic in the other — driven by the thought of being able to represent my country at my third Olympics, to step into battle, to fight to win a medal while wearing my country's flag. But, first things first…start pushing a bobsled. As a track athlete it seemed like an easy task: get from point A to point B as fast as possible. And I definitely know fast. Easy transition right? Not quite. My first push, I felt my 70-kilogram frame buckle under the weight of the 165-kg sled in front of me, as I attempted to get it moving. Is this thing on ice or super glue? After 14 years of being taught to find power with my arm swing while running, having to keep my hands connected to the sled made for quite the sight. I also had the unique problem of being fast enough to simply run behind the sled, without actually contributing to accelerating it forward. Get as many reps as possible behind a sled. After two weeks of practice in the Ice House, and lifting heavier than I ever have in my life, we had push testing, which would be used to initially rank the brakemen. I tied for the third fastest time. Not too shabby for only two weeks under my belt. I felt excited at the prospect, excited at the potential, excited to see progress. It's all up from here. If only the path to progress was a straight linear line. Staring down the icy chute of an actual bobsled track is a very different feeling from the safety and calm that I got used to practising in the Ice House. The green light in front of me indicates I have 60 seconds before we have to go…I feel my anxiety rise, my heart beats out my chest, thoughts race through my mind. How do I setup my feet again? My hands feel weird in this position. The sled feels like it wants to run down the hill, how do I…? I feel Kaillie’s shoulder next to mine, as she setups up to go. Bobsled has a unique culture of “just get it done.” And for an athlete who is an analytical, a control freak, that makes for a hard road. In training, the first time you get behind a sled is when you are actually at the block, readying to go down the track. As a track athlete, I’m accustomed to getting a few practice runs in my warm up. For example, a few runs over three hurdles, before my last efforts over eight hurdles: to ease into my workout, to feel the things I want, to make the adjustments I think are necessary. But in bobsleigh, there is no practice sled in the warm-up area. You have to be ready to go at the block. You have to be ready to bring maximum intensity. And with only two training runs per session, there is no time to waste. Brakemen are constantly being evaluated. 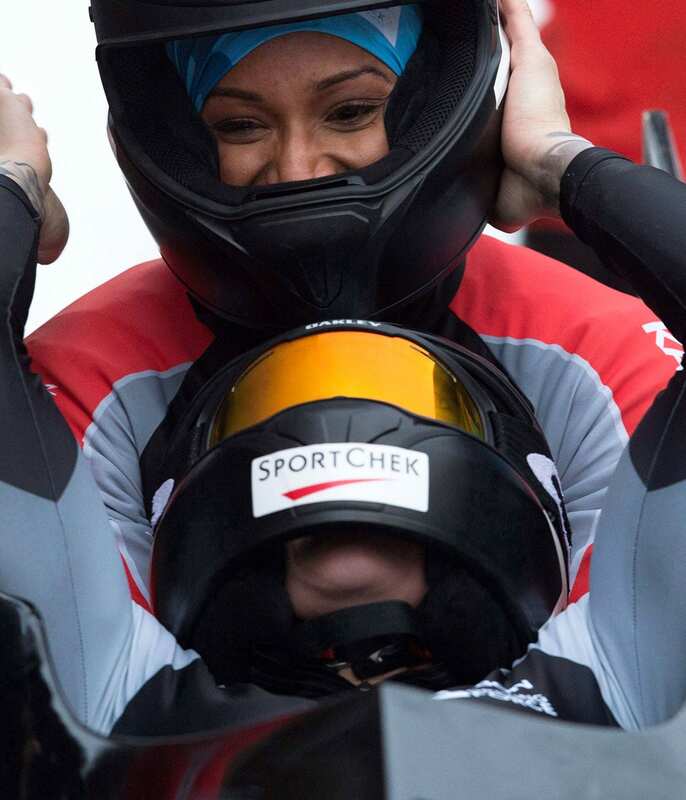 With only three Canadian women sleds, there are only three spots for brakemen. So it’s a constant fight for your position. Every time we are behind a sled, it is a chance to show what we have, or don't have. In my first month of sliding I felt myself unravel. Overthinking would be an understatement. I was still trying to learn what to do, but I only had two runs on the days I was sliding. I felt obligated to try to make them perfect. I constantly compared myself to the other girls pushing. I struggled to find the correct positions behind the sled, because I simply wasn't strong enough. My nervous system was so taxed from the constant G-forces I experienced in the sled. I was tired, stressed, and worried. For the first race on the World Cup, I wasn't racing. I was a spare. My job on race day? Unload and flip the sleds. Help move the sleds to the start line. Collect my racing teammates’ clothes as they stripped down to their speed suits to race. I questioned myself. What am I doing? Why am I out here? Maybe I’m just not built for this? Maybe I should just head back to track and get ready for my indoor season…From Canada’s No. 1 hurdler to a rookie bobsled spare. This isn't how I thought things would go. I stopped looking at the times I was pushing in training, and more importantly, I stopped looking at what the other girls were pushing. Comparison can be the thief of potential. I decided to define success on my own terms. Every day before practice I identified two things I wanted to execute, and if I did those things, it was a successful day. I had a group of people; coaches, teammates and therapists, in my corner helping me every step of the way. Teaching me the ins and outs, pouring themselves into my goal, believing in my potential, and I soaked it all up. I felt myself get stronger. I gained 5kg of lean mass and added 15kg to my Power Clean personal best. I felt myself get more comfortable with the technique, but most importantly, I felt myself get more confident. The night before my first World Cup race, I felt my stomach fill with butterflies. I could hurdle in my sleep, blindfolded, but now I have a teammate who is relying on me. Am I ready to compete in a bobsleigh race? As soon as I slipped my headphones on to start my warm up on race day I felt my worries melt away. There is a sweet spot in competition where it feels like the whole world drifts away, where you are so in tune with your body, where things are just happening and you’re not even sure how. I might not have competed since August, but my body definitely remembers how to compete. As I strapped on my burn vest I felt like a warrior putting on armor. As I zipped up my speed suit I felt…ready. I raced in the last four World Cup races, earning my spot on the team along the way. Every time I stepped to the block on race day my feet easily found their position, my hands simply felt like an extension of the sled as I held the sled strongly in position. Kaillie’s shoulder firmly pressed against my arm, as we both placed our full trust in each other, ready to go from 0-100 real quick. On Jan. 24th, I was named to my third Olympic team. My first Winter Olympics. I will walk to the block with the maple leaf on my chest. Canada on my back. Ready to step into battle. Ready to fight for a medal for my country.